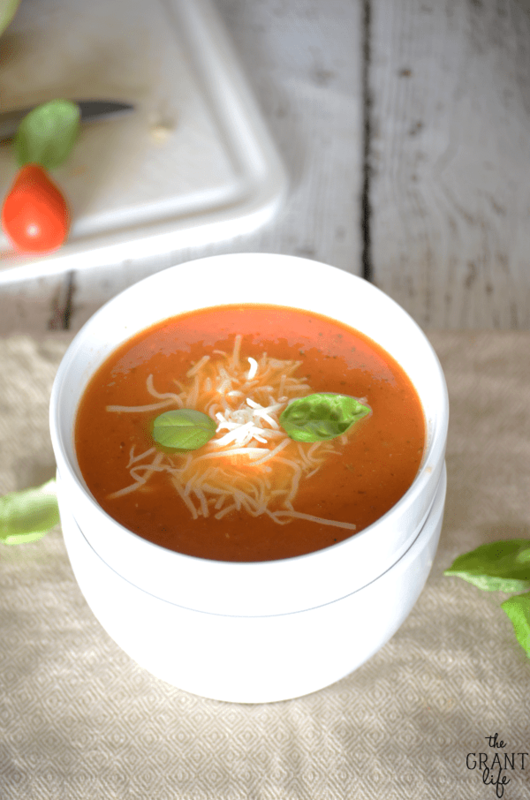 Fresh herbs and vegetables make this tomato basil soup irresistible. I feel like I left a lot out when I was talking about our Austin trip this weekend. I talked about 6th street because, well that ish is crazy. Towards the end of the night (like 1-2 AM) I can’t even count the number of people I saw being held up by friends while attempting to walk down the street. I did happen to catch one girl who was being held up by a friend with her skirt up to her waist. Yup. I’m pretty sure it was in that moment that I thanked the Lord that I was past that stage in my life. But I digress. Prior to seeing all that we went to a really nice place for dinner called Bangers. Like bangers and mash? Yea, it was cool. I also had a bajillion beers on tap so the guys were all pretty happy. They were playing old country Western and had a dance floor in the center and long picnic tables outside. It was very rustic. I had a chicken and sundried tomato sausage and Ryon had some boudin with red beans and rice. Everything was amazing. I like food. From Bangers we went back downtown to a comedy club called Esthers Follies. We had been before when we were babies in college, like our freshmen or sophomore year. [Seriously, it was like 10 years ago that we went.] It’s right in the heart of downtown and the stage actually has glass windows looking out to the street so people can see in. And you can see them. Which is super fun because regular people on the street sometimes become part of the show. I could go on about the show but all I will say is it mixed magic and comedy – go! If you are ever in Austin, go! So much fun. After the bar we went back out onto 6th street in search of pizza. I didn’t eat, I just people watched. Go-go dancers, cowboys, college kids in sweater vests, girls in yoga pants and heels, dudes without shirts on, monkey suits, unicorns. That’s 6th street for ya. We made it home safely and then had an ahhh-mazing brunch the next day. Mulberry in case you want to go. Be sure to get a cappuccino and the lemon ricotta crepes. Or whatever. Just go. SO good. I like food. Saute the onion and the garlic in the butter on the stove top of 5-10 minutes. Stir in the broth, tomatoes and the basil and bring to a boil. Then puree the soup in a blender or food processor until smooth. Top with mozzarella cheese and enjoy! I’ve never been to Austin, but I’d love to visit one day. And oh my gosh, this soup! This I can enjoy in short order. It sounds amazing. Sounds like a great time, and this soup looks amazing! I wish I had a bowl right now! 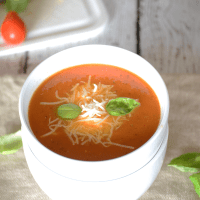 Tomato soup is the queen of comfort food and your version sounds amazing! One look at this and I know what I want for dinner tonight. Thanks for the inspiration. My pleasure! Hope you enjoy!! 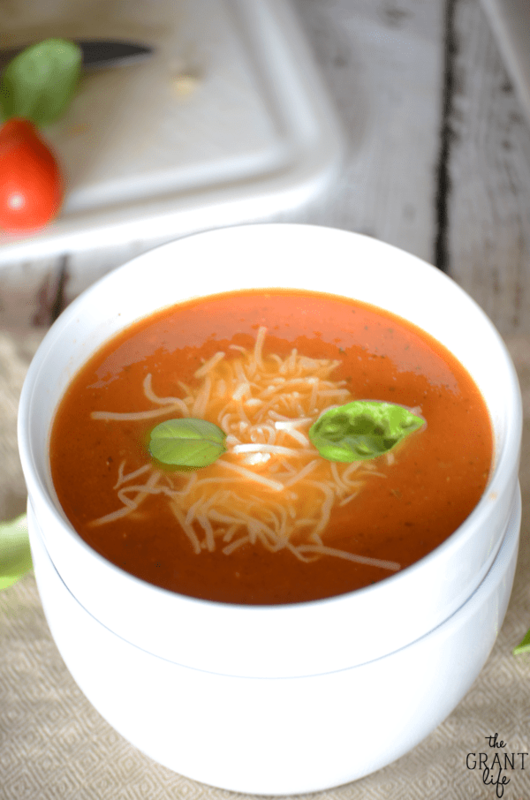 I LOVE TOMATO SOUP AND THE FACT THAT YOU ADDED BASIL IN IT, IS SIMPLY AMAZING! mAKING ME WANT T MAKE THIS TODAY FOR LUNCH, mMMM! Yes! I’m such a basil fan.. its the best! Hope you make it Connie.. its so easy! I LOVE tomato basil soup!! This looks awesome! And your Austin trip sounds like a blast! Thanks Jen! We had fun for sure! Austin sounds like so much fun – I’m dying to visit! 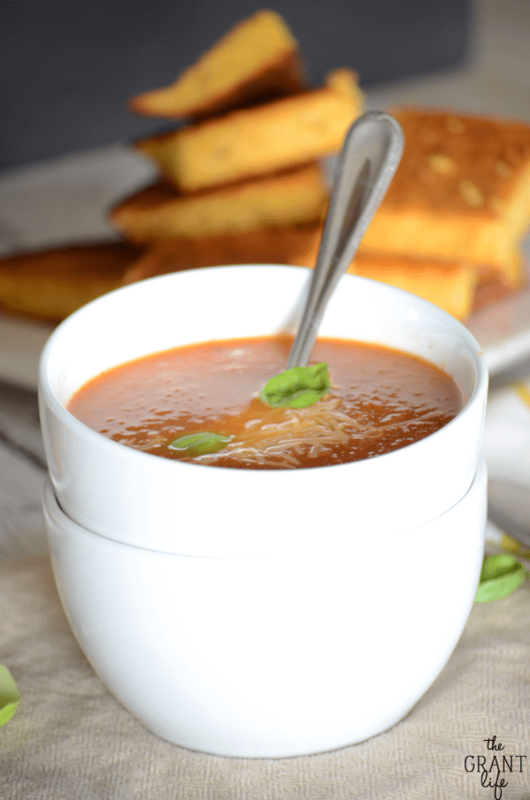 This soup is the perfect thing to eat on a cold winter day. 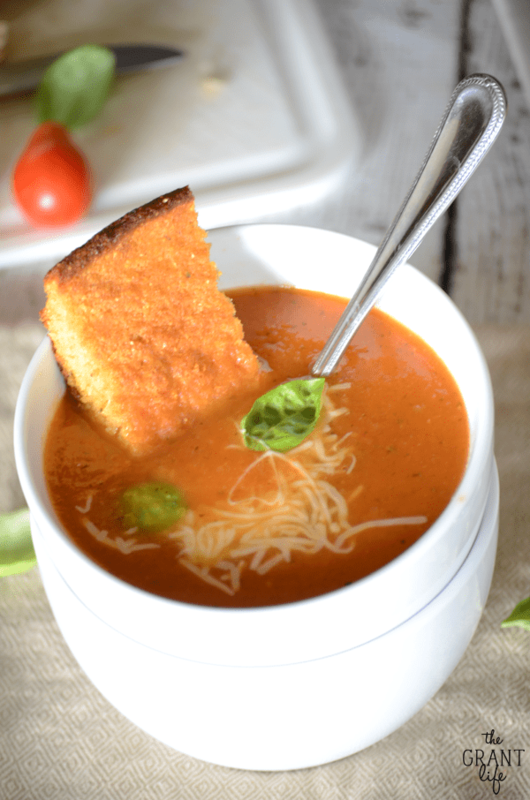 nothing beats tomato soup with grilled cheese! 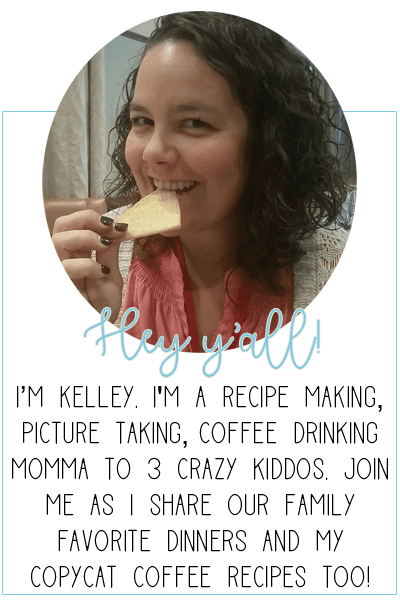 Austin is super fun.. especially if you are a foodie! So many great places to eat and things to see. I bet you would have a blast!